The Florida Panthers forward won the Calder Trophy in the owners' lockout-shortened 2012-13 season, but he followed up being named the league's top rookie with two middling seasons. He rebounded in 2015-16 with a 20-goal campaign alongside Aleksander Barkov and the ageless Jaromir Jagr, but Huberdeau was disappointed when he wasn’t selected as one of the young guns with Team North America for World Cup of Hockey 2016. So he set out to prove that fall that he belonged among the game’s best young talent, only to suffer a massive setback. In the final preseason game, late in the first period against the New Jersey Devils, Huberdeau was engaged in a battle behind the opposition’s goal with Devils centre Sergey Kalinin. The right skate of the New Jersey player came down and sliced Huberdeau’s left ankle, leaving him with an achilles tendon injury that required surgery and a four-month recovery. “It was devastating for this to happen right before the season,” the native of Saint-Jerome, Quebec said. “If you have offseason surgery and rehab, you’re not around the guys and your team is not playing, so you just get to work to get better. In his first game back on Feb. 5, 2017, Huberdeau scored the game-winning goal in a 2-1 win at home against the Anaheim Ducks. 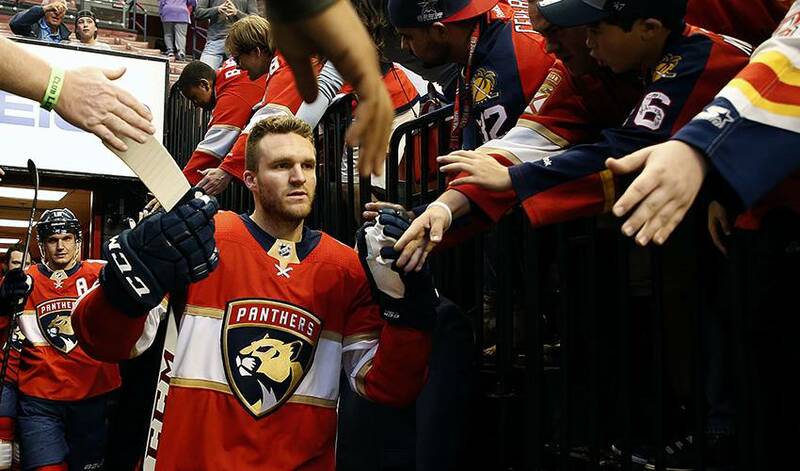 The Panthers won six of seven first outings in Huberdeau’s return and he went on to score 10 goals and 26 points in the final 31 games of the season. The result was a 2017-18 season that was his best yet. He set career highs in games played (82), goals (27), assists (42) and points (69), this time performing alongside Barkov and Vincent Trochek. Huberdeau still is a smidge below 100 percent in terms of his left ankle, but his solid season impressed teammates like defenceman Keith Yandle. “The biggest thing for me was he came back and didn’t seem to lose a step,” said Yandle, who joined the Panthers in the summer of 2016. “I played against him before, but playing with him I have a bigger appreciation for the way he plays. “When he came back, I was impressed of how well he skated. In this league, you have to be fast all the time. Yandle admires Huberdeau’s athleticism and attitude, and he believes the former Calder Trophy winner will be a leader on the Panthers for a long time to come. Next on Huberdeau’s checklist is to help propel the Panthers back into the playoffs after missing the past two postseasons. The spring always has been Huberdeau’s time of the year. As a 16-year-old rookie with the Saint John Sea Dogs, he helped his junior team advance to the QMJHL final against the Moncton Wildcats. The next season, Huberdeau and Saint John not only skated to a QMJHL Presidents' Cup championship, the Sea Dogs won the Memorial Cup, too. Huberdeau won the Stafford Smythe Trophy as the Memorial Cup tournament MVP. “I’m a team-first type of person,” Huberdeau said. “I want to be one of the leaders on the team and be more consistent. I had a pretty good year and we had a pretty good year with 96 points for only the second time in team history.